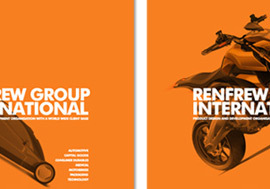 Renfrew Group: identity and stationery design for a Leicester based product design consultancy with a wide range of clients. One of their key areas is automotive design. We offered a range of options but it was this abstract flowing design, based upon the letter 'R' that was chosen. Though it's flat, it is suggestive of a three dimensional shape, almost looking like the top edge of a product catching the light. 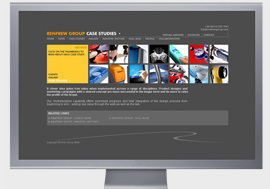 Renfrew Group: print design and advertising.